It was a clear August morning with the promise of a bright and sunny day ahead. There was a coating of frost on the fly of our tent. Ice crystals covered the short grasses on the hill above us where the llamas were bedded down. A layer of ice had formed on the llama buckets overnight. We could see our breaths as we heated water for tea. We watched the sun light up the tops of the rocky summits to the west of us and very slowly work its way down to the base of the ridge and across our little valley until it found us. We were deep in the heart of the High Sierras camped at the 10,800 foot elevation above Upper Palisade Lake in Kings Canyon National Park. We were following the John Muir Trail from Florence Lake in the north to Cedar Grove in the south, about 90 miles. This camp was just past the halfway point and our eighth night out. There were seven of us: Dave, my husband; Douglas, our son; Ebenezer, our dependable old stud and packer; Magma, our younger new stud on his first long pack trip; Graysun, a four year old pack gelding, son of Ebenezer, and the best stringer we ever had; Q, younger brother of Graysun on his first long pack trip; and me - wife, mother, chief pack trip organizer, and author of this story. We already had covered some of the roughest ground on the trail. Coming down off of Muir Pass at nearly 12,000 feet is as rocky as any trail I have hiked in the Sierras. 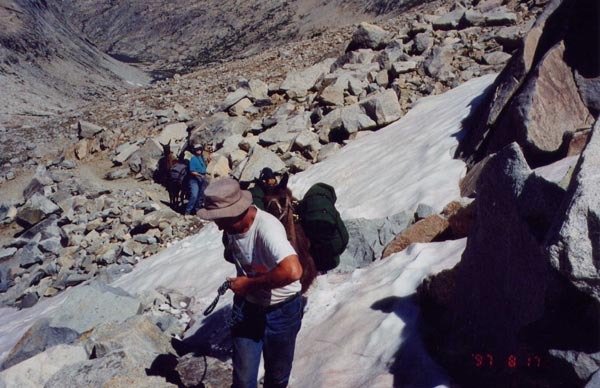 There are steep snow chutes to cross and tons of rocky rubble to traverse. Magma bruised a pad in this stretch of trail and gladly lifted his foot that night in camp for an application of DMSO. 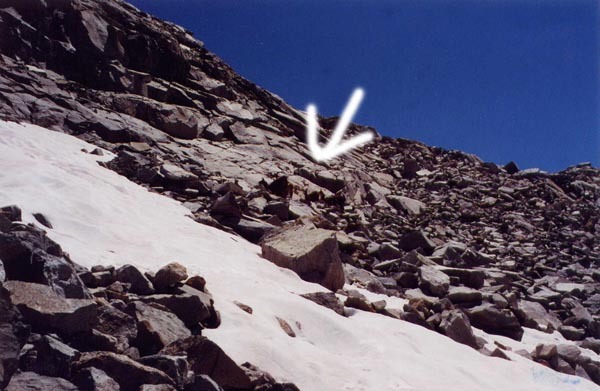 This is the rough rocky trail below Muir Pass. Climbing up into the Palisades was no piece of cake either. The famous Golden Staircase is a section of trail touted as being one of the most difficult to engineer and build. Switch back upon tight switch back climb straight up the cliff with elaborate rock work holding the trail in place. This was all behind us now. Ascending the Golden Staircase. We are looking down on some of the switch backs. Ahead lay Mather Pass. At 12,200 feet, it would be the highest pass on our journey. We had heard stories about the north face of Mather where the snow would gather and stay long into the summer. One fellow had told us of a horse that slipped while crossing one snow chute and fell 150 feet to the rocks below. We knew that there was snow on the trail. We figured it would be frozen and icy. How bad would it be? Dave spent the previous evening carving a shovel out of an old piece of white bark pine. It was a masterful work of art in my eyes, maybe 30 inches long with a blade about eight inches wide and 12 inches long. The beautiful grain of the wood was smooth, waxy, and heavy with pitch. We tied it on top of one of our pack boxes. It was still frosty and cold as we began our climb up the mountain toward the pass. Though we were working hard in the thin air as we made our way upward, we were not getting too hot. We kept on a layer or two. Pretty soon we were following a zigzag of switch backs up the steepest part of the climb. There were occasional snow patches that obliterated the trail. Sometimes it was difficult to pick out where the trail continued. There was no vegetation, only the rocky rubble of the steep talus slope and snow. Then we came to the big one, the big snow chute. This view is looking up across part of the challenging icy snowfield we traversed just below Mather Pass. You can see the llamas in the very center of the picture. This gives an idea of the scale of the landscape. It was tucked into the shadow of the mountain. The snow was solid packed ice. It was 30 to 50 feet across at the section we needed to traverse and shot straight down the mountain at a 45 degree then 60 degree slope. On all sides there was loose rock piled deep. The stones were angular and rather jagged. They ranged from the size of a throw pillow to that of a hay bale. When you tried to climb across them, they moved. Dave got his hand crafted shovel off of Magma and went to work chopping a trail in the ice just above 45/60 degree mark. He would have preferred an ice ax, but you make do with what you have. The llamas waited quietly with us. The bit of trail we stood on was narrow. It dropped off below us and loose talus was stacked above us. There was nothing on which to safely tie a llama lead rope. Once the icy path had been chopped, we took the panniers off the llamas. The plan was to take the llamas one at a time across the snow chute and up the talus on the other side to the trail high above us. We reasoned it would be safer for the llamas if they did this without their loads. We could rope the panniers up the chute after all the llamas had made the traverse. Douglas moved across and up first. The rocks shifted and moved beneath him. Dave followed with the first llama, Magma. We held our breaths. The ice was not a problem thanks to the carved path. But the talus was another matter. Rocks moved and tumbled under the weight of the llama. Dave moved the llama back onto the icy chute while keeping his boots on the rocks at the edge of the ice. The llama had no problem moving up the ice. Soon they were both on the trail above with Douglas. Douglas' job was to hold the llamas at the top since there was no place to tie the llamas. I held the llamas waiting their turn to go at the bottom. Pretty soon, Q and Graysun were up on the trail with Magma and Douglas. Things were going pretty well. Ebenezer stood with me and watched the whole operation carefully. I wondered what he was thinking. One of many snow patches we crossed climbing up Mather Pass. Ebenezer and I probably saw it at the same time. Up above, coming down from the pass was a woman with two llamas. I could not believe my eyes. Ebenezer was watching intently, ears forward and alert. I hollered up to Dave and Douglas. At first, they seemed not to hear me. Then they saw it for themselves. I yelled to the woman to wait where she was. Dave called to her and said, "We've got llamas here. It is an icy chute. You wait there with your llamas and let us bring up the last one of ours. Then we will help you move your llamas down." Dave was already on his way back down to get Ebenezer. He moved carefully to avoid causing a rock fall or slipping down the chute on the ice. The woman paused, then ignored what he said. She tied one of her llamas to a rock, one of those moving, jagged rocks. Then she started down the talus with her other llama, fully loaded. Anyone who knows llamas, knows that when llamas meet, especially unfamiliar llamas, there is a lot of llama excitement. They are dying to blow into each others faces and get a sniff under the new guy's tail. We humans do our best to control this type of contact, but the llamas still get worked up. They stand erect and snort into the air looking at one another. This llama excitement is what was going on as the woman and llama passed beneath Douglas and the three llamas he was holding. At that moment, some of that loose rock broke free and began tumbling away. Other rocks shifted and rolled just below our llamas and spooked them. Douglas, young and overwhelmed with too many llamas to take care of, lost control of Graysun and Q. They dashed back across the ice field high above me. Graysun's hind legs fell into a deep hole melted out next to a large boulder. I figured for sure he broke a leg. Ebenezer with the wisdom and experience of his years, stood his ground next to me and watched the debacle unfold. I could not understand why the woman had ignored us and attempted such a reckless and unsafe act. With the whole talus slope moving beneath her and avalanche a serious threat, the woman moved to the icy chute with her llama and proceeded to hike down it like nothing had happened. She was dressed in short shorts, a halter top, boots, and a little visor. She was fairly young, in her 20s, yet her skin was bright pink, freckled and somewhat leathery from all the exposure. A single blond braid hung nearly to her waist and a large camera with a big lens dangled from her neck. She slipped and fell face first onto the ice with her head pointed downhill. She lost hold of the lead rope and slid lickety-split on her bare belly down the chute. When she got to the path Dave had chiseled in the ice, she somehow managed to stop her fall. I thought she surely was headed for the bottom. 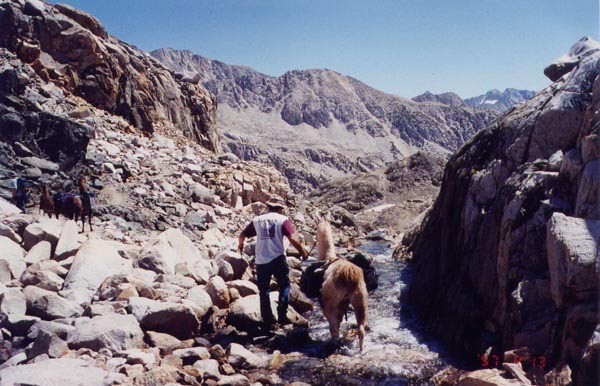 Her llama took off back across the talus getting dangerously close to where it dropped away. I hollered at him, "Harry, stand!" I had heard her speak to him by name before her fall. And miraculously, he stopped where he was, turned to look back at me, and stood in place with his load still intact. Dave by now had made three trips up the chute with llamas. Each time he had to pause and catch his breath. Remember that we were over 12,000 feet in elevation at this point. With all that previous effort exhausting him, Dave now had to work his way slowly and carefully up the ice field to reach Graysun and Q. Neither Douglas nor I could help as we were holding onto llamas above and below the chute, and we most certainly did not want to lose any more llamas on the rocks and ice. By the time Dave got to him, Graysun had pulled himself out of the boulder hole. His leg wasn't broken. But Graysun and Q were still spooked and didn't want to be caught easily. At that moment, three backpackers came up the trail. These were university professors in their 40s or 50s that we had met before along the way. One of them was Asian. He used a Tibetan-English dictionary and spoke English with an accent. He was nimble and sure-footed and did not breath heavily in the thin air the way the rest of us did. (Later on, after this incident, we referred to him privately as our Sherpa.) Sizing up the situation, he asked me if he could help. I dug two picket ropes out of a pannier and asked him to take them up to Dave. Doffing his backpack, he easily bound up the ice and rock. Dave and he used the long ropes to catch Q and Graysun who by this time were both ready to be caught peacefully. In the meantime, the woman had gingerly picked herself up off the ice. She walked out across the talus to retrieve Harry. She led him across Dave's ice path to where I stood with Ebenezer. There was scarcely room to turn around. Ebenezer was terribly excited as the woman and llama crowded past us. She was oblivious to the trouble she was causing. She stooped to tie Harry to a rock behind Ebenezer. I suggested that if she was going to leave the llama that she let me hang onto him. I also suggested that she unload the other llama before bringing him down the chute. She agreed, then took off back up the chute to retrieve her other llama. Dave and our angel Sherpa brought Q and Graysun to my place on the mountain. Now I had four llamas to tend to. Dave rested a moment trying to catch his breath. Magma, in the meantime, was getting rather upset because he was only llama up above and because the other llama belonging to the woman had broken loose from the rock she had tied him to and was headed on his own down the talus. She managed to catch that llama after some dodging around on his part. She left his panniers above and brought him down the chute. Dave and our Sherpa started back up the chute with Q and Graysun. This had gotten very complicated. Now, I had the woman's two llamas and Ebenezer. She went back to get the panniers. I sized up her two llamas. She told me they were just three years old, that she bought them just three weeks before in Bishop, and that she immediately began hiking with them and had been on the trail all this time. They were small, much smaller than any of our llamas. Both were fairly woolly. In fact, Harry was very very woolly with long fine fiber over all of his body. I felt their bodies. They were extremely skinny, just skin and bones. The long coats were dirty and matted. Their loads were big and heavy, heavier than the loads we expected our boys bred for packing to carry. 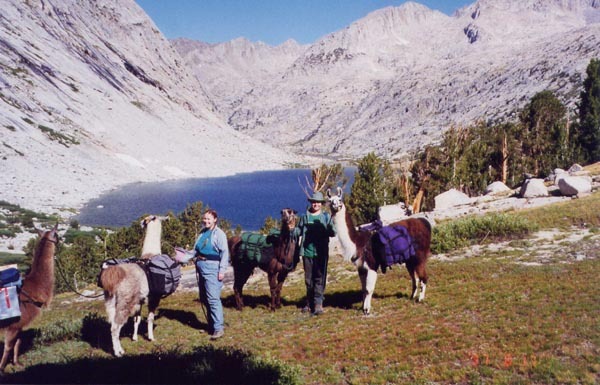 The llamas were carrying climbing rope, a saw, a large fishing pole container, a folding lawn chair, six-packs of beer, and bottles of hard liquor in addition to the usual camping equipment and food for a trip lasting many weeks. It was obvious to me that the woman with the llamas didn't know much about them. I felt sorry for Harry and his buddy, Nelson. I made up my mind to help reload them so I would have the opportunity to offer some llama education for their mistress, the itinerant hiker. Molly, as I had asked her name, was already preparing to lower her panniers with her climbing rope. She paid no attention to the fact that Dave was trying very hard to bring Ebenezer up the chute to join the other llamas and asking her to wait a minute so he could get out of the way. In fact, she didn't seem to care at all that she had created a situation that could have gotten a human or llama seriously injured or killed. There was no regard for our animals or us whatsoever. Fortunately, the other two backpackers helped Douglas hang onto our four llamas up on the trail. Dave and the Sherpa helped Molly lower her bags down the chute. While they roped our bags up, I helped her resaddle and reload her animals. Their saddles were askew from all the hubbub. She had decent Flaming Star saddles on the animals, though the cinches barely tightened enough due to the small size and emaciated state of the llamas. I asked her if she had a brush since the hair was matted and stuck with pine needles and sticks. When she said she didn't have one, I realized these poor animals had never been groomed let alone sheared. There were rubbed spots on their backs. I wondered if there were sores but had no time to check. She had homemade panniers that hung awkwardly below Harry's belly. I asked if she had salt or a supplement for the llamas. She didn't. I suggested that at the next opportunity she ought to get a loose salt and mineral at the minimum. I told her she needed to spend a couple of days in a good meadow and give the llamas some time to eat. Their toenails were broken and torn as if they had started hiking with long, overgrown nails. Of course she had no clippers to clean them up. Once loaded with all the extra paraphernalia tied on top, the llamas looked pitifully small and over-loaded. I gently tried to impart as much llama wisdom as I could in the few short minutes I had. She didn't seem interested, and I suppose she figured it wasn't my business anyway. Then Molly was on her way down the trail with Harry and Nelson in tow. Now it was my turn to climb up the chute and help load our llamas. The three backpackers said their good-byes, and we said our thank yous over and over. Those folks really saved our bacon, especially the Tibetan who never once was out of breath. 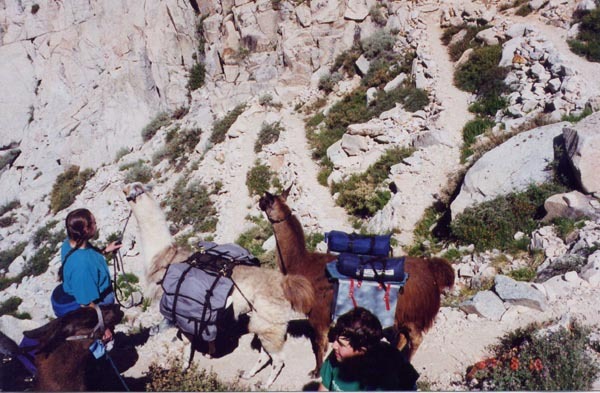 Once we were all loaded up and hiking again, we and the llamas all took deep breaths and began to relax. I looked at my watch. It had taken us over two hours to go 100 feet. After a very short walk to the pass, we paused for photos before continuing on our way to hopefully less difficult adventures.